You know things are Jim Dandy when you can play online bingo in the privacy of your home and have a blast in the process. Dandy Bingo is keeper that should be placed in your favourites list for nonstop thrills. They are ready when you are anytime the bingo mood strikes. Dandy Bingo is a newer site, launching in March of 2011 and has proved to be a site that is straight up in entertainment and bingo value you just can’t beat. The online bingo has a lot to offer even for the most discriminating bingo players. This dandy site is packed with all that is desirable for not only the new player but existing ones too. Signing up is uncomplicated and straight away you'll be on your way and in the bingo action. Dandy Bingo is powered by the Cozy Gaming software. The software has developed into a full gaming suite of products. The homepage is light, airy and refreshing with a pallet of soft colours that are easy on the eyes. Dandy Bingo is owned by Chelbis Company Limited, a member of the Fun Bingo Network and licensed by the Malta Lotteries and Gaming Authority. Unleash the bingo inside and let your hair down in a great platform of exemplary games. The only drawback I found at the time of writing this review is not having the convenience of viewing the games without registering an account first. Once inside the lobby, players can choose an array of bingo rooms that offer 80 ball, 90 ball, 75 ball bingo. Having more than one or even two variations of bingo is major plus. Progressive Jackpots are available for all variations of bingo. Rooms offer Side Games and Chat Games hosted by the Chat Moderators. One of the nice perks about playing here is the option to play in real cash mode or Bingo Bucks. A decent sized collection of Slots are offered with a unique flare that only Cozy Games can provide. Features include not only Free Spins but unique Bonus Games like Hot Habanero Slot with an exciting Wheel to spin loaded with cash prizes. Progressive Jackpot Slots include Lucky Devil, Fish Toons, King of Slots and more. Other Games include Table Games, Scratch Cards and Video Poker. New players are offered a Free Bonus that requires no deposit to get started. Don’t let the three step process dissuade you because it is really quite simple in a three step process. A Welcome Bonus and Reload Bonuses are ready to boost your deposits. Deposit Specials are a Monthly event with loads of incentives. Monthly offers are loaded with special promotions that have included amazing holidays, Slot Tournaments with big cash prizes, Amazon Vouchers and something exciting and new every month. Invite your friends and you will receive an incredible reward that keeps on giving for 60 days . BOGOF bingo cards are featured on select games with juicy Guaranteed Jackpots awarded to players. Dandy Bingo offers plenty of ways to earn Free Cash including the Magic Wheel where players can win up to £1,500 absolutely Free. There is oodles of Bingo Bucks given away and increases your chances of winning cash prizes. We rate Dandy Bingo with 4.75 Pink Hearts. A great find! 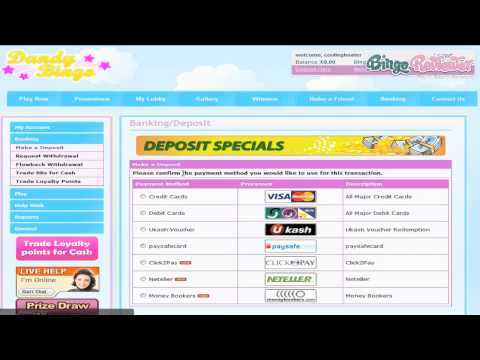 Dandy Bingo has nice deposit specials. One of the first things you’ll notice about this site is their awesome welcome bonus. New players will receive a cool £20 free upon joining the site. There is absolutely no deposit required to receive this free cash and start playing. I found their registration process to be straightforward and easy to do. I was done and ready to start playing with my free cash in no time at all. There are tons of promotions going on all the time at this site. You really can’t go wrong with any of them. One of my favorites includes the unlimited chat games that take place daily where you have the opportunity to double up on your points. They also have a fabulous rewards program here that allows players a wide range of benefits and treats. Overall, I always have a great time when I am playing here and the customer support is really on top of things. One thing you will definitely be in for is huge jackpots! One of the better Cozy games powered casinos, Dandy is a site with modern design and really god layout, looking equally good on bigger screens with higher resolution. Too bad they still don't have the mobile site version, since I like to play games on my tablet. I always love to use a no deposit bonus, and this time was no different. After successful sign up, new players receive £20 bonus (check the terms for WRs), which I spent quite fast, without making a lot to talk about. Luckily, this guys have a huge depositing bonus, and for first three deposits, you get a total of 900% bonus. You also have monthly specials, depositing bonuses and other ongoing promotions, so I suggest that you check them all out before starting. They also have slots and some other games in stock (like the regular casino games), so you won't be bored anytime soon. This site has a very nice look to it. The layout is nice and cheery and what’s even better is they have so much to offer. I agree that they have a pretty incredible welcome bonus up for grabs. Without making any kind of deposit, new players will receive a free gift of £20. This cash can be used to do with as you please. In addition to this, they also shower new players with a 900% bonus spread across the first three deposits. They have an awesome selection of gaming here that includes a variety of bingo, slots and other casino games. Their jackpots can get pretty big as well and the games are well worth playing. Another thing I like about playing here are the really nice promotions. On top of this, they also utilize comodo security technology. This is top dog when it comes to keeping your private information secure.